Workers use a boat to recover supplies from a flooded grain elevator in Caruthersville, Mo., a farm town along the swollen Mississippi River. The Ohio and Mississippi River levels were falling Wednesday at the site where engineers blasted holes in a Missouri levee to relieve pressure. But unleashing torrents of water across 35 miles of farmland in what has already been a terrible flooding season could carry other consequences. 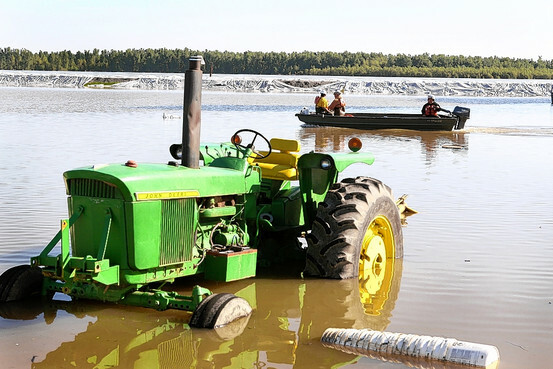 One risk, scientists cautioned, is fertilizer runoff from the flooded farm country along the Mississippi. As it moves downstream, they predicted it would contribute to the largest-ever summertime depletion of oxygen in the Gulf of Mexico, posing a substantial risk to marine life. The concern is that the water is likely pulling up components of fertilizers—notably nitrogen and phosphorus—and washing them downstream toward the Gulf, helping slash oxygen to levels marine life can’t survive, said Nancy Rabalais, a marine scientist who is executive director of the Louisiana Universities Marine Consortium on the Gulf coast. Those chemicals act as nutrients in the Gulf, intensifying the growth of microscopic plants. Microbes eat away at those plants. In the process, they consume oxygen, reducing it to levels that kill marine life. See the latest data from flood gauges throughout the Midwest and South. In the days leading up to the U.S. Army Corps of Engineers’ breach of the levee near Birds Point, Mo., authorities began removing fuel and other chemicals stored in tanks in a 35-mile long floodway bordering the Mississippi River, said Karl Brooks, administrator for the Environmental Protection Agency region that includes much of the Midwest. In addition to the effects in the Gulf, another concern has begun to emerge: drinking water. Much of the Midwest gets its water from rivers, and scientists say they’ll be monitoring to see whether the floodwaters show elevated levels of nitrate, a derivative of nitrogen in fertilizers. Nitrate can cause sickness, particularly in infants, the EPA says. Water-treatment plants filter out nitrate to government limits. But "the faster the water moves across the land, the more sediment it picks up, and the more nitrate and other pollutants," said John Downing, a professor at Iowa State University specializing in inland-water issues. James Kopp, chemistry manager for the water division in St. Louis, said nitrate levels of water filtered in the city don’t appear to be any higher than in a normal May—a month when nitrate levels are typically elevated because of spring runoff. Not far from the breached levee, some 3,800 Western Kentucky residents have evacuated their homes as the Mississippi River and its tributaries continue to rise. Kentucky, along with Tennessee, Mississippi, and other Southern states have been urging evacuations and bracing for what state officials say could be near-record crests of the Mississippi River in the coming days after the intentional breach of a flood wall upstream in Missouri. Heavy rains on Monday and Tuesday brought as much as four-and-a-half inches of rain to Kentucky and have contributed to flooding that has already hit low-lying parts of the state; in addition, authorities expect the Ohio River to crest on Thursday, and the Mississippi River to do so on Friday. The levee breach sent water rushing across the Birds Point-New Madrid Floodway, and water levels Tuesday dropped as much as three feet from expected levels on the Ohio River at Cairo, Ill. The Corps blew a second hole Tuesday and was preparing Wednesday to blow a third, to let the water drain back into the river. Springtime flooding is natural along the Mississippi, as melting snow and ice and seasonal rains swell the river. But in recent years some floods have gotten more severe, and their ecological effects heightened. Officials probably won’t have a sense of how the flood affected the area until the weekend, when they expect rushing water will have slowed enough so they can enter the area and begin environmental testing, said the EPA’s Mr. Brooks. "Until we see what the landscape looks like, it’s going to be hard to know how extensive that is," he said. This week’s flooding comes one year after the country’s largest-ever offshore oil spill sent 4.1 million barrels of crude into the Gulf ecosystem. For decades, summertime oxygen levels in a large swath of the Gulf spreading out from the mouth of the Mississippi have plummeted to levels that have killed fish, shrimp crabs and other marine life. The oxygen depleted areas, known as dead zones, began to appear in the early 1970s, also the time when chemical-fertilizer use was intensifying on Midwest farms, said Ms. Rabalais, a dead-zone expert. Even before the latest flooding, high water levels along the Mississippi earlier this year were creating signs of an earlier—and larger—than normal dead zone in the Gulf, she said. Now, she said, scientists are predicting a Gulf dead zone this year far larger than the prior record—an 8,500-square-mile dead zone in 2002. Donald Boesch, a University of Maryland oceanographer who has been studying the Gulf dead zone for decades, said he also believed "it looks like we’re in for a record" this year in the dead zone’s size. The breaching of the levee in Missouri may end up adding to the dead zone "a small amount," he said, but the main cause is heavy spring rains this year, which have sent more nutrients down-river. The Corps sought to minimize any environmental damage in breaching the levee, said Edward Lambert, an environmental-compliance official for the Corps. But he added: "We had to do it quickly. And human life takes precedence."